As announced last week, The Displaced Nation is honoring Pocahontas this month for the role she played in advancing communications between two very different cultures. This week, we take a closer look at Pocahontas’s decision to marry the Jamestown settler John Rolfe. Did the Rolfes have an easy time of it in their married life? History doesn’t tell us, but as the veteran of two cross-cultural marriages myself (first to a Brit, now to a Japanese), I tend to think not. Sure, the union had its advantages for both parties. We know for a fact that two years after marrying Rolfe, Pocahontas was invited to voyage to England with her husband, where she met many prominent people, including King James I. We know also that Pocahontas’s father, King Powhatan, gave the newlyweds property just across the James River from Jamestown, spanning thousands of acres. But being in the mood to play devil’s advocate, today I will make the case for why Pocahontas and Rolfe should have hesitated before tying the knot. 1. Marriage across cultures is rarely seen as one of equals. Nor was I ignorant of the heavie displeasure which almightie God conceived against the sonnes of Levie and Israel for marrying strange wives, nor of the inconveniences which may thereby arise,…which made me looke about warily and with good circumspection, into the grounds…which thus should provoke me to be in love with one whose education hath bin rude, her manners barbarous, her generation accursed, and so discrepant in all nurtriture frome my self. After much soul searching, Rolfe decided he could marry Pocahontas despite her crude education, barbarous manners and different colored skin — as long as she converted to Christianity. In the above portrait of the couple, by J.W. Glass, Rolfe is instructing Pocahontas in Christian doctrines. And now let’s turn to Pocahontas. Did she see Rolfe as her equal, given that he was a mere tobacco farmer, and a foreign invader, and she was the daughter of the most powerful chief in the region? According to historical records, the news of the liaison was well received by the Powhatan tribes, helping to create a climate of peace toward the Jamestown colonists for several years. 2. The fantasy quotient in such marriages can lead to huge disappointments. 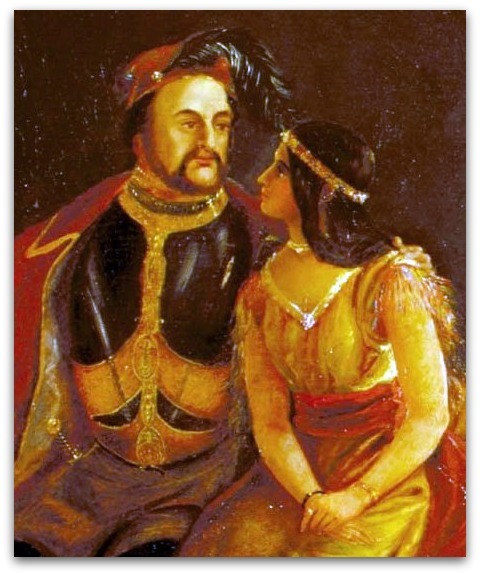 In Glass’s portrait of the couple, John Rolfe gazes down lovingly into the eyes of a young woman with long, straight, dark hair. He seems to be thinking of Pocahontas as his trophy Indian princess — how exotic she is compared to his English wife (who died on the boat coming over). But what if, at that very moment, Pocahontas is calculating the advantages that could accrue to her and her tribe from their liaison — including representing her father’s tribes to the powers-that-be in London and arguing against their displacement. Would it crush Rolfe to learn the practical agenda she had in mind for their marriage? At the same time, though, the painting shows Pocahontas gazing upwards at her husband-to-be. A young girl, she must have harbored a few fantasies as well. Maybe she found Rolfe much more refined than the Indian men she had known — she’d already had an Algonquian husband by then. In that case, how disappointed she must have felt when, after the wedding, she discovered his habit of chewing and spitting tobacco, overheard him swearing like the sailor he once was, and noticed his tendency to stomp around the place. Why can’t he be more like an Algonquian man and walk as quietly as a leopard? 3. Sons tend to turn into their fathers, and daughters into their mothers — but how can you possibly anticipate this if you can’t read the culture? Likewise, had Rolfe been able to meet Pocahontas’s mother, I imagine he would have thought of her as a kindly Indian squaw — having no idea of her ability to control, coerce and manipulate others to her will. 4. In times of strife, the last thing you want is a cross-cultural misunderstanding. We marry for better or for worse, but during the worst of times, most of us could do without a partner who is culturally clueless. By the same token, if Rolfe’s tobacco crop failed due to drought, he may not have felt like dancing with Pocahontas, despite her insistence it would bring on the rains. Most of the above, of course, is pure conjecture, but it is also based very closely on my own observations. I’ve witnessed quite a few romances in the Rolfe-Pocahontas mould — particularly while living in Japan. And I’ve seen quite a few of them turn sour. I’ve also experienced firsthand how devastating it can be if one’s spouse can’t communicate properly when the going gets rough and you don’t have the energy to make allowances for the fact that they come from a different culture. In my experience, the most important quality one needs to have for a successful cross-cultural marriage is that of being a glutton for punishment — a quality I just so happen to have in spades. Not wanting an easy life — that’s what it all boils down to. And, unless you have a calling for handling complication piled on complication, then I would suggest choosing a mate who lived in the same neighborhood as you growing up — preferably next door. Question: Do you agree that cross-cultural marriages are unusually challenging? STAY TUNED for tomorrow’s RANDOM NOMAD interview, in which our special guest will answer a Pocahontas-related question. To me I think cross-cultural marriages work best when the other person is your peer (and the right person for you) in a majority of rooms around the world. When your couplehood only works in rarified environments (especially one that you cannot or will not be confining yourself to) then things can really get hairy. If we think about all our own personal realms as distinct cultures — what kind of upbringing you’ve had, your education level, your professional experience, your traveling life, your exposure to therapeutic environments, etc — then we have a better idea of how many cultures we actually have in common with our spouse-of-a-different-culture. How we solve problems, what our attitude about money is, our ethical make-up, our values and world view…those are “rooms” too. Most of us have the capacity to bond with someone in a limited way, but if you’re considering long-term couplehood, bonding in a limited way will put a ton of pressure on an already tough proposition. One point I would want to add is location, location, location. If the couple doesn’t work out and there are children, you don’t get to go home, because in many cases you don’t get to bring the children back to your country even if you get custody. You might be forever bound to the country of your spouse. I have seen this played out so many times. Cross cultural marriages create additional issues when the marriage doesn’t work out. It’s hard to think about when you’re in love and don’t have children yet, but the future can bring a lot of heartaches. I always love the discussions and interviews here at TheDispalcedNation but this one, in particular, really hit home. Anatasia’s construct of being very aware of all your different “rooms” and “personal realms as different cultures” is so important. Personally, these are aspects of myself that I am still discovering. I’m always amazed when I hear about couples, same culture and mixed culture couples, who “click” and make it work from a young age. I met my Turkish husband when I was in my thirties but had dated men from other cultures before that. I know I didn’t have the self-awareness to make those relationships work and every day it’s a work-in-progress for us to keep peeling back the layers so we can connect genuinely as “peers” and partners. I’ve had 2 cross-cultural relationships, one with a Ugandan man and the other with a fellow Brit, but from a very different background to mine. I wanted both to work, I tried very hard to make both work, but it’s the assumptions that we make and stumble into that are the hardest to predict. I love a challenge! And strive for the out-of-the-ordinary. The thought of that boy next door would just not excite me BUT, in times of difficulty – stress / sickness / lack of money etc etc – it really tests your patience when you have to explain and work thru stuff that the boy next door might just ‘get’ without explanation. Would I do it again? Without doubt, yes. You learn so much about yourself, even if ultimately the relationship doesn’t work. I don’t have children (was almost talked into it by one of the above); THANKFULLY I decided I wasn’t ready; it would have been a mess. Ooo, I’m going to have to disagree. I’m in a cross-cultural marriage–we’ve been together 9 years now and barely spoke the same language when we met–and I really feel like my husband and marriage are some of the best things that have ever happened to me. But like Justine, I married late, not until 39. So I think it’s maybe more an age thing than a cultural thing. As we get older, I think we are more able to know ourselves and know if culture or something else is going to stand in our way. Very fine post. I am now 25+ years into my cross-cultural relationship. For almost all that time we have lived in his country which is at this MY country too. I would add to your list that one should tread very carefully before having children. The marriage can dissolve but the children are for life. When you are the foreign spouse, you can leave the marriage and go home but in most cases you can’t take the children with you. This may mean that you may not be happy in that country but returning to the home country is, for a lot of parents I know, just unthinkable as long as the children are young. Oh and I should mention here as well Gabrielle Varro’s work which is really extraordinary. She is a researcher here in France at CNRS and she did studies on American/French marriages. She look at power in the relationship and she measured it by what the American spouse was able to negotiate in that context with a particular focus on religion and language. Fascinating results over three generations of Franco-Americans. She wrote a book about it called The Transplanted Woman which I highly recommend. I’d love to see it – thanks! My first marriage was to fellow MK (she was raised in Costa Rica, I in Colombia), but it turned out that family and personal differences trumped the shared TCK culture. Now I’m in a very happy cross-cultural marriage, to a Colombian lady I knew briefly 40 years ago and found again four years ago. Despite cultural differences, we are personally very compatible, and neither feels like we’ve had to make major adjustments. She’s loving life in the US, although she misses her son, who chose to stay in Colombia to pursue a future in soccer. Our plan is to buy an apartment in Medellín and a condo in the US and split our time between the two countries once I can retire. Sure cross-cultural marriages are challenging, but we’re an adventurous lot! My first husband was a Tico raised in part in the US, whereas I was raised mostly in Latin America (including Costa Rica). We understood each other well and yet the marriage didn’t last. I blame his machismo (I know plenty of nice Tico men who are not thus afflicted so I’m not blaming it on culture); his mother blamed my house-keeping. The second time around has been the charm for almost 30 years. Having been in a cross cultural marriage for more than 27 years- it gets better and better with each passing year. Although I’ve experienced a very wonderful experience– I know alot of it has to do with who my husband is– and thus, having said that– we often do counselling with cross cultural couples and encourage them to ‘count the cost’ before they head into the relationship…..just as we would tell anyone else heading into marriage to do the same. If one thinks seriously before saying “I do”…a cross cultural marriage can turn out to be very wonderful…my husband calls it our own “Fusion Culture” 🙂 Neither my husband nor I really knew each other when we got married- so we always say our first few years of our marriage were the ‘dating’ years…and once we passed what is difficult for most people we were so far in we only could go forward 😉 But seriously, challenging…but wonderful!